The Reagan is medium brown in color with some mild mottling. There are moderate veins present, although the coloration and square pressing disguises them. The wrapper is smooth to the touch, with a light oily sheen and no tooth to speak of. Giving it a quick once-over, it is firm to the touch but without noticeable hard (or soft) spots. The construction is sound, with an expertly applied triple cap and tight, wellbuilt seams. The prelight aroma of both the foot and wrapper is of lightly sweet tobacco with a mild hint of cocoa. Flavor from the unlit draw is more cocoa and/or chocolate, and the draw itself is slightly firm, but not overly tight (especially considering the press). The earliest puffs give a healthy burst of spice on the retrohale – not too harsh, but noticeable. This spice is actually a pleasant surprise. As one who is easily overwhelmed by too much “nasal napalm,” I am sometimes sensitive to a spicy cigar. The Reagan has a more robust dose than the Inception, but still quite manageable and comfortable. The spice is further tempered by the sweeter background flavors. In this first section of the cigar, I’m getting a lot of sweet leather and stewed fruit – plum, even. Early on, the burn is outstanding, producing a variegated salt & pepper colored ash. Going into the middle segment of the Reagan, the early spice remains at about the same fervor to my senses, but has changed slightly in character. It is possibly a bit milder, but that could very well be palate acclimatization. There is more of an acidic tone – and I intend that to be a positive remark. The acidity is just enough to activate the ol’ salivary glands, so it is literally a mouthwatering cigar. Very pleasant. The spice continues to complement the flavors in a sweet vs. savory interchange. I have paired today’s Reagan with a cup or three of plain black coffee, which as it turns out is a beautiful, beautiful thing. I have smoked one other Reagan previously without accompaniment, and the coffee really seems to draw out and emphasize the subtle flavors therein. The burn remains quite well behaved, consistently producing the aforementioned black and white ash. Going into the final two inches or so of the Reagan, the flavor profile comes into its own. The earlier sweetness really develops, taking on a sweetened cocoa quality that truly shines. The spice has subdued at this point, although you can still unearth it with a retrohale. With the cocoa comes a lovely sweet leather flavor, which sallies forth in the aroma as well. These flavors continue to build toward the end of the smoke, leaving me wanting more. Not more from a cigar….more of these cigars. The room note – for lack of a better term – is very unique as well. 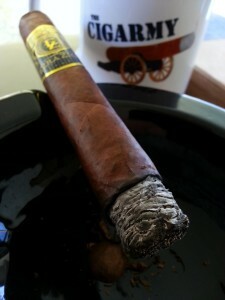 It is quite unlike most cigars in that it smells more sweet than savory. I associate the lit aroma of many cigars with a campfire, or more specifically burning oak. The Reagan reminds me more of the charred apple I use in the smoker when preparing salmon. 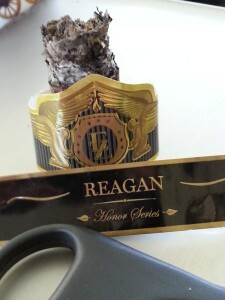 My wife is not exactly a fan of the smell of most Nicaraguan cigars – but were she sharing the patio with me today, I think even she would appreciate the Reagan. The burn remains consistent to the very end, and during the two examples I’ve smoked I believe I’ve only needed to perform one minor touchup. That is impressive considering my compulsion to manicure the ash on most sticks. Cigars come and go. Cigar companies come and go. But from all appearances, the guys at Ezra Zion are here for the long haul. I have to admit that early on I reserved no small amount of skepticism about a company so ambitious as to go after the über premium market with their initial release(s), and wondered if that market would support a new brand without an established history. As is often the case, I find myself chowing down on a good bit of crow over those thoughts. The Inception was an absolutely phenomenal cigar, and the Reagan no less so. Both are impressive, each in its own right. While drawing the initial puffs from my first Reagan, my thoughts were that I preferred the Inception. Shortly thereafter, however, I had reversed course faster than most of our contemporary politicians. At this point, I’m not entirely sure which I prefer…but I’m sure as heck enjoying the continuing process of figuring that out. Being a strong proponent of doing things correctly or not at all, I am fully onboard with the philosophy behind the brand and I look forward to the coming days as Ezra Zion continues to create new blends and lines. 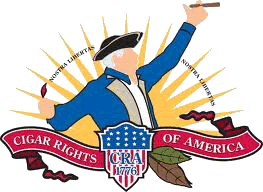 It’s a great time to be a cigar smoker. Phenomenal review Kip, much appreciated. I can’t wait to stick one of these in my mouth! 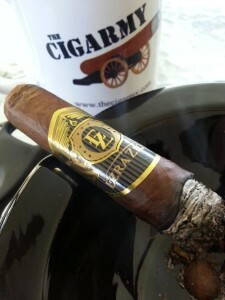 As I told the guys at EZ, they couldn’t have picked a more appropriate name for their first cigar in the honor series, and it sounds like the cigar lives up to the name.